When you’re getting ready to move to a new home, it makes sense to entrust the job to a dependable name. 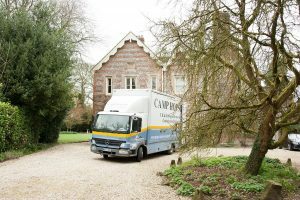 At Camp Hopson, we’ve been doing removals in North Hampshire for seventy years. That’s seventy years of acquiring experience, refining skills and perfecting strategy. As a consequence, we offer moves that minimise stress and maximise efficiency. We diminish disruption at every turn, using moving techniques that have been honed to a shine. We also know the area incredibly well – the main thoroughfares and the small lanes – and we can get you quickly installed in your new property. Other removal companies in North Hampshire may have the talk, but we walk the walk. We also provide full packing/unpacking on request, so that the experience can be even more carefree and relaxed for you. Difficult and challenging items, including vast grand pianos and works of art, are safe in the skilled and experienced hands of our packers, all of whom are also fully trained in the dismantling and reassembling of furniture. We do not use casual workers – our team is made up of people who are trustworthy and qualified. We are also a BAR-certified (British Association of Removers) company, which means that we’re held to certain standards, all of which we delight in either reaching or exceeding. On the day of your move, we’ll be there at the right time, ready for all eventualities. As we carefully remove everything from your old home, we’ll take care not to bash paintwork or damage carpets and banisters. Everything is done at considered speed, never manic or rash haste. Once we’re at the destination, everything can be unloaded and then unpacked in the appropriate rooms of your new home. If you’re using our unpacking service, you’ll be able to relax in your new surrounds from the first evening onwards. Why live in a sea of boxes and disorder when you don’t have to? When you first contact us, we’ll organise an estimator to come and see you. Your move and its unique requirements will be discussed so that a full quotation can be drawn up and issued to you. If you need storage in North Hampshire, then you’ll be pleased to know that we have excellent, clean, safe and secure facilities. It could be that you have more stuff than you realised and don’t know where to put it. Our units, available short- and long-term, give you all the time you need for settling in before you decide what to do with your surplus belongings.